This is the time of year when southern Ontario comes alive with vegetables, fruit and herbs. Chalmers guests have always received as much produce as we can afford to buy and we are now beginning to add to our regular purchases with donations we receive from farms, community gardens and individual garden plots. Harcourt United church’s communal garden was created in 2011 from a tiny strip of grass next to the parking lot. It had been for many years the dumping ground for snow during the winter months. Since that time the garden has produced and donated in excess of 4000lbs of fresh, organic food to Chalmers. There are many people to thank for this effort, especially the volunteers who faithfully weed, water and harvest the produce. 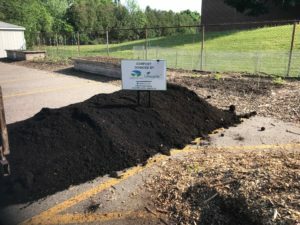 The City of Guelph, through its community garden initiative, has supplied water barrels and delivers a load of mulch when requested. This year we were especially grateful to receive from the AIM ENVIRONMENTAL GROUP a supply of compost which will help maintain the garden’s productivity. AIM’s generous donation to the Harcourt garden was based solely on the fact that all produce goes to an emergency food provider – Chalmers. To all those gardeners who read our newsletter – if you have surplus produce you wish to donate over the next few months, Chalmers guests love to receive fresh vegetables and fruit so please send it our way.